Take a deep breath, get ready, set, and juggle. This seems to be the theme of my life. I say this like I am overwhelmed, but I am just the opposite. I love to be busy, and I love to serve. My newest adventure is directing "Beauty and the Beast" at our elementary school. This is my second year doing this, and I am so excited! I had 115 kiddo's come and audition. Everyone of them get a part of course, but it is so fun to see their cute faces, and hear their sweet voices. So much talent in this school! I love these kids. Dance season has begun and is in full swing. Randilynn will be busy with dance 4 nights a week, and with playing the part of Babbette in the play. I am taking a dance class too, along with trying to find time for yoga, take care of my busy family, Ty's piano lessons, volunteering for the Foster Care Foundation, Jude's speech, and Early Intervention appts. I am excited to start Peer Parenting for DCFS. I sure didn't last long not being involved as a foster parent. I just love to be able to help these kids who don't come from the best of circumstances, and to be able to help their families learn how to become better parents for their children. I have seen some parents change their lives, and become better for their family. I also have seen many parents fail after getting their children home. This is why it is so important to have peer parents involved with these families. A peer parent is involved in helping when the children are getting ready to transition back home, and to offer support when needed. These families need more support, and I am excited to be able to help.Our home is full, but the idea of still being involved makes me happy. I feel so blessed to have the life that I have. Sure I have my own little trials in life, but I am so extremely lucky to have such wonderful friends and family in my life. Although my life seems to be going so well, some others in my life whom I care and love, are not having it so easy. I wonder at times why the people who have an amazing spirits, kind souls, who are compassionate, sweet, nonjudgmental and have a testimony with unwavering faith seem to have to endure the most excruciating trials in life. I don't have an answer to that question, but I have faith in my Heavenly Father, and that He truly does what is best for all of us. I know that we have trials to learn, and grow from. Its been so long since I have blogged, that I knew it was time to update. Where to start? I guess the best place to start is that in 2016 my son Tyler was called to serve a mission in the Tallahassee Florida mission. He was to enter the MTC on July 20th 2016. He was ecstatic, and we were as completely ready as we could be for him to go the week before the 20th. 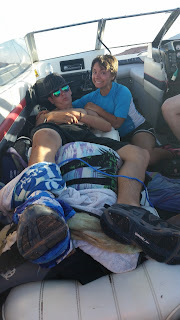 We decided to go to Lake Powell as a family 1 more time before he left. When we got home he would leave 2 days later. Tyler decided to really be careful not to do any extreme sports so that he was safe and healthy to leave. He really took an easy, so we thought. Sometimes freak things happen! Many of you know, and understand the the joys and the hardships of motherhood. I have found myself struggling to find joy in motherhood lately. I have been feeling overwhelmed in my abilities to be the kind of mother that my children need. My babies have some struggles, and there are days that I wonder, how will we get through the day. I want to be be everything that they need, but some days it just seems that I am not enough. This morning as I woke up, I realized that even though I feel like I am perhaps "failing" them, that we are in this together. If I truly do my best, that the Lord will make up for, and help me to know what I can do to help them. What can I say, I am the luckiest women alive. I am married to my best friend and soulmate Steve. We have 5 beautiful children, whom we love with all our hearts and souls. I am very involved with writing music, directing theatre, and performing in theatrical productions. I love the Art's, and feel so blessed to have a husband who let's me follow my dreams. The gospel is the foundation of our home, and I love my Heavenly Father, and my Savior. We are blessed to have the gospel in our lives.